The Flight Test Historical Foundation hosted the Gathering of Eagles Oct. 1 at the Antelope Valley Fairgrounds in Lancaster, Calif. The annual event celebrates significant events in flight-test history. This year’s program honored the team that successfully accomplished the first flight of the Lockheed Martin F-117A Nighthawk some 35 years ago, and shepherded the revolutionary stealth fighter through developmental testing. Honorees named as Eagles this year included test pilots Hal Farley, Skip Anderson, Jon Beesley, Tom Morgenfeld and the late Dave Ferguson. 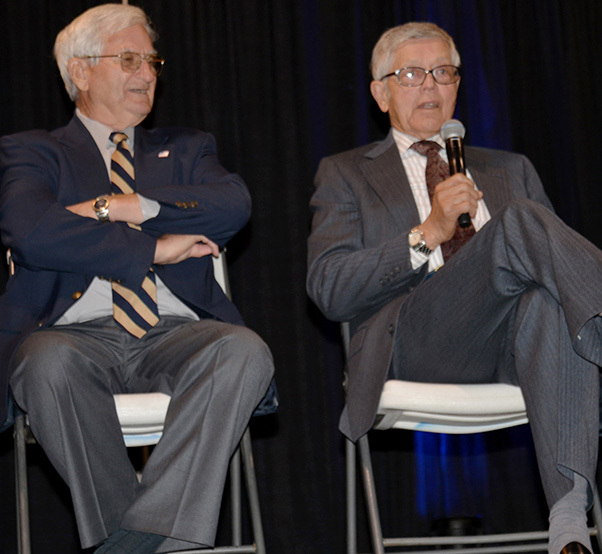 Larry McClain and Pete Winters, who served as the first two commanders of the responsible test organization, were named honorary co-chairmen of the event. The F-117A was the first combat aircraft designed to be virtually invisible to hostile air defenses. 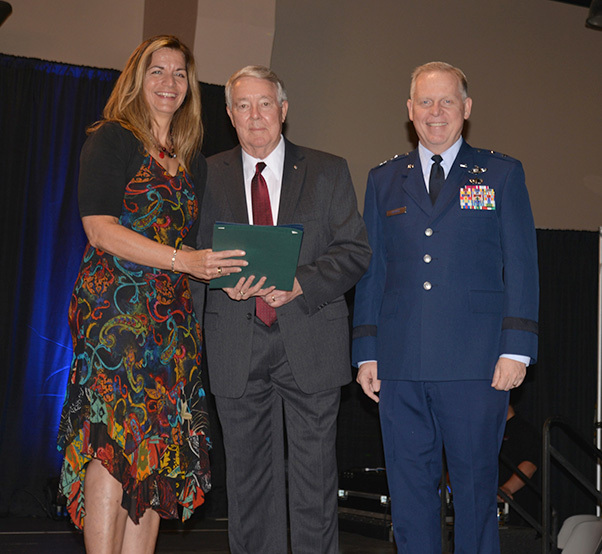 Lisa Gray and Maj. Gen. David Harris present Hal Farley with a certificate at the 2016 Gathering of Eagles. As a Lockheed test pilot, Farley was the first person to fly the F-117A. Designers at Lockheed’s Advanced Development Projects division, famously known as the Skunk Works and now a part of Lockheed Martin Aeronautics Company, used sophisticated techniques involving radar-absorbent material coatings and structures, advanced avionics and structural shaping to render the airplane low observable or “stealthy” to radar and infrared sensors. Developed as a clandestine “black” program during the late 1970s, tested in the early 1980s, and subsequently deployed to operational units, the F-117A remained a closely guarded secret for many years. The first flight took place June 18, 1981, and was piloted by Harold C. “Hal” Farley. Farley became a naval aviator in 1959 and later worked as a test pilot for Grumman Aircraft Corporation He joined Lockheed in 1979, where he was assigned to be chief test pilot for the F-117A, and was eventually promoted to director of flight operations. He retired in 1991. Leslie B. “Skip” Anderson III graduated from the U.S. Air Force Academy in June 1963 with a BS in Astronautics, and later earned a masters degree in Aerospace Engineering from the California Institute of Technology. Following several operational assignments, he was accepted to the USAF Test Pilot School at Edwards Air Force Base, Calif. After graduation, he managed and piloted a variety of test projects. In 1979, Anderson was assigned to command a classified test force at a remote location, where he oversaw and participated in the first developmental test flights of the F-117A. On June 28, 1981, Anderson became the first Air Force pilot to fly the secret airplane. 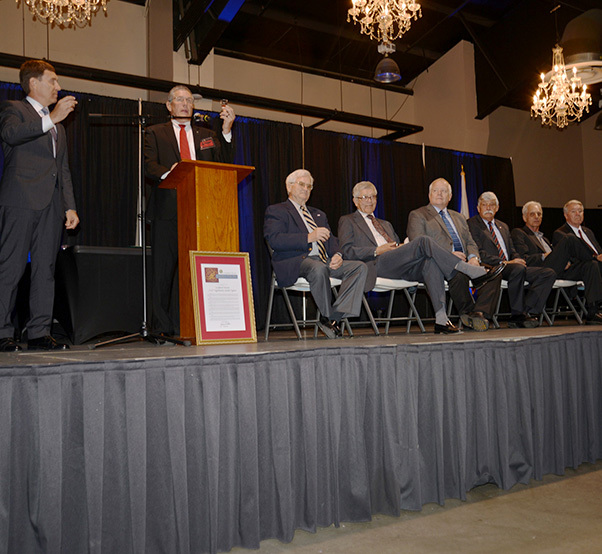 Moderators and honorees raise a toast to those members of the F-117A Combined Test Force who could not be present for the 35th anniversary celebration. From left to right: Bill Gray, Jim Brown, Pete Winters, Larry McClain Jon Beesley, Tom Morgenfeld, Skip Anderson, and Hal Farley. Jon S. Beesley graduated from Utah State University with a B.S. Degree in Physics and was commissioned in the Air Force in 1972. Following operational assignments flying the F-4, he graduated from the USAF Test Pilot School in 1979 and began his flight-test career working on classified programs. Selected as the operations officer for the F-117A combined test force in 1981, his efforts focused on flying qualities and envelope expansion flights. Beesley left the Air Force in 1986 and joined the General Dynamics Corporation in Fort Worth, Texas, as a test pilot in the F-16 and YF-22 Advanced Tactical Fighter prototype. He later worked for Lockheed Martin test flying the F-22A and F-35. He retired in 2011. Thomas A. Morgenfeld, a 1965 graduate of the U.S. Naval Academy, had two fleet tours where he flew 90 combat missions and amassed more than 500 carrier landings. He graduated from the Empire Test Pilots’ School in England in 1975, and was assigned to a Navy test squadron, where he participated in several classified test programs. In 1979, he entered U.S. Air Force exchange duty with the 4477th Test and Evaluation Flight at Tonopah Test Range, Nev., where he was responsible for all Navy involvement with tactical exploitation of Soviet fighter aircraft. He then joined Lockheed and was assigned to the F-117A test program, and later flew the YF-22 and X-35. David L. Ferguson flew two combat tours in Southeast Asia before graduating from the USAF Test Pilot School in 1972. He flew several test programs in the U-2, F-105, and F-4 before being assigned to classified programs. Upon retirement from the Air Force in 1979, he joined Lockheed as a test pilot for the F-117A. He subsequently piloted the first flight and initial airworthiness demonstration of the YF-22, and was later promoted to director of flight operations. He retired in 1999 and died in August 2011. His widow, Jan, represented him at the banquet. Former Lockheed chief test pilot Hal Farley describes the first flight of the F-117A. “It was the highlight of my career,” he said. Larry D. McClain was selected to attend the USAF Test Pilot School in 1958. Following graduation, his first task was to test fly a T-33 coated with radar absorbent material, a forerunner of modern stealth technology. His test career was interrupted by a one-year tour of duty in Southeast Asia, where he completed 200 combat missions. He returned to Edwards for assignments on the F-4 Test Team, as deputy commandant of the Test Pilot School, director of the F-15 Joint Test Force, and assistant deputy commander for operations at the 6510th Test Wing. McClain was selected in 1977 to command the responsible test organization that oversaw the Have Blue stealth technology demonstration program and developmental testing of the F-117A. After retiring from the Air Force in September 1981, he went to work for Northrop as manager for flight-testing the B-2 stealth bomber. 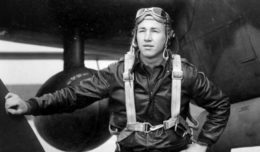 Charles P. “Pete” Winters had several operational assignments and that included flying 298 combat missions in Southeast Asia, and was then selected to attend the Aerospace Research Pilot School at Edwards. Upon graduation in July 1970, he remained at Edwards as a test pilot in the F-111 and F-15, and was one of two pilots to participate in projects to develop an armed remotely piloted vehicle for enemy defense suppression missions. Following assignments in Europe, he became vice commander of the remote test site for the F-117A, and in May 1981 assumed command from McClain. Winters retired from active duty in 1988 with the rank of brigadier general. In 2000, he formed JT3 LLC, a joint venture of EG&G Technical Services Inc. and Raytheon Technical Services Company, to pursue the U.S. Air Force Joint Technical Services (J-Tech) contract to consolidate eight technical support contracts at the Air Force Flight Test Center, China Lake Electronic Combat Range, Utah Test and Training Range, and Nevada Test and Training Range. 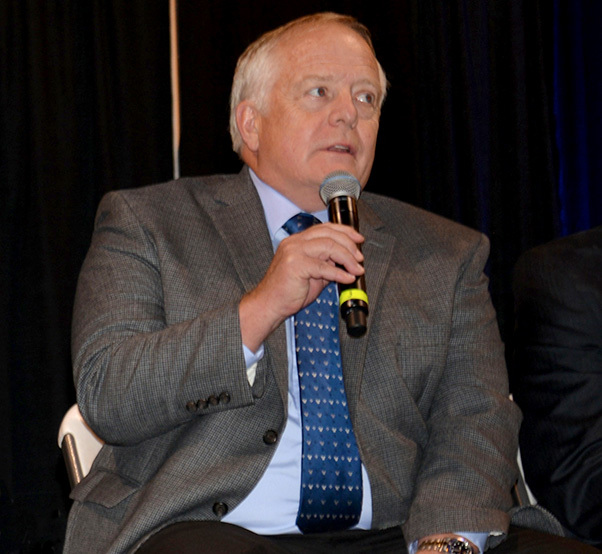 John Beesley lauded the efforts of the F-117A Combined Test Force that had to operate as a highly integrated military/contractor team under conditions of utmost secrecy to make the high-priority stealth fighter program a reality. 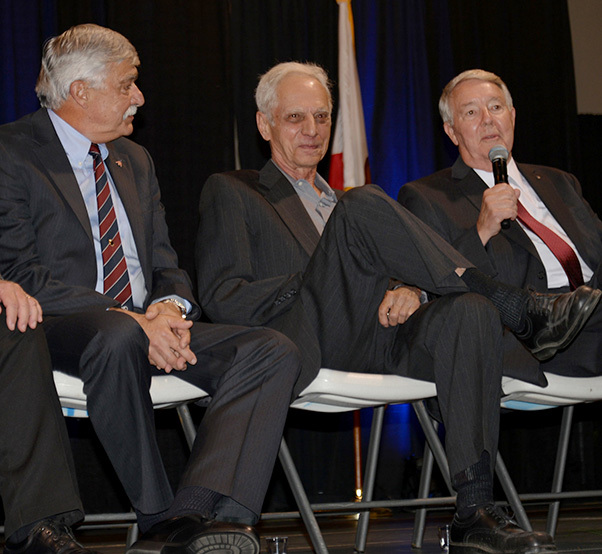 The highlight of the 2016 Gathering of Eagles was an hour-long panel discussion with the honorees, moderated by former F-117A test pilots Jim “JB” Brown and “Evil” Bill Gray. Commenting on the airplane’s unusual shape, Farley said that the first time he saw it he thought it must be a supersonic aircraft or a space reentry vehicle. “It was a shock when I found out what it really did, but it turned out to be a very glamorous program anyway,” he commented wryly. In describing his first impression of the original wooden mock-up, Anderson was less charitable. “I thought it looked like the box the airplane should come in. Morgenfeld shared a story about the time the nose wheel fell off the airplane on takeoff. The test director wanted him to eject, but instead, he finished the test cards and made a successful emergency landing on the test site runway. Several days later, Lockheed Skunk Works chief Ben Rich jokingly presented him with a union grievance for grinding down the nose gear strut without proper training or engineering approval. McClain spoke about sharing command duties at the remote test site with Winters. Larry McClain, right, and Pete Winters served as the first two commanders of the remote test site during the early years of the F-117A program. “Pete and I were proud to be there at such a watershed moment,” he said. “Great men flew the airplane; we were just there to hold their coats.” He added that the pilots being honored at the Gathering of Eagles had been supported by untold others — technicians, maintainers, flight-test engineers, etc. — who have never received credit due to the secret nature of their work. “The nation owes them much,” he said. Thus far, only a handful of early model F-117A airframes have been preserved for public display. 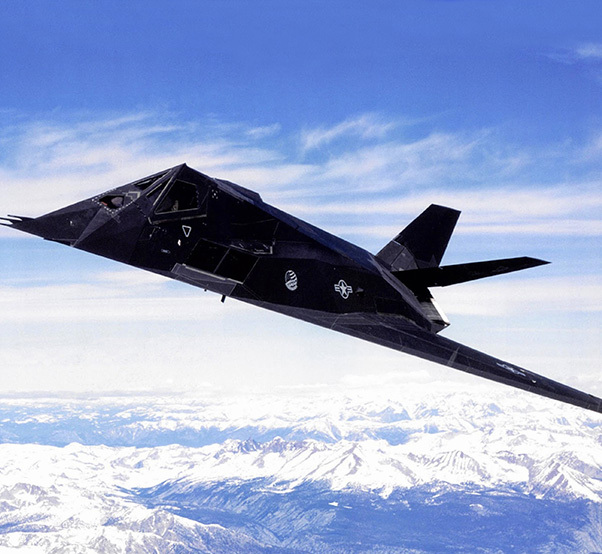 One of these, a YF-117A full-scale development prototype, was added to the Air Force Flight Test Museum collection in 2008 following extensive demilitarization and restoration efforts by personnel from the 410th Flight Test Squadron at Air Force Plant 42 in Palmdale, Calif. This milestone event was the culmination of nearly two decades of planning by museum staff and Air Force officials who had to wait for the Nighthawk fleet to enter its retirement phase, and until the airframe destined for display was no longer needed for testing. Additionally, to inspire future pilots, engineers and technicians, each year the foundation announced the recipients of the C. Gordon Fullerton Memorial Scholarship and the William J. “Pete” Knight Excellence in Aerospace Scholarship, each in the amount of $2,000. The 2016 winners included Theara Boon Kwok and Stephanie Leathers, both students enrolled in the California State University, Long Beach, Antelope Valley Engineering Program and graduates of Antelope Valley College. For more information about the Air Force Flight Test Museum or the Flight Test Historical Foundation visit www.afftcmuseum.org.